So, did iOS 11.0.1 fix iOS 11 battery life issues? We take a look at both in a side-by-side detailed video comparison. It happens every single year, without fail. Apple releases a brand new major version of its mobile operating system, everyone gets excited about the new features and main improvements, and then when it finally drops, the main topic of conversation is the battery life. The furor ultimately dies down, twelve months pass, and the cycle repeats itself. 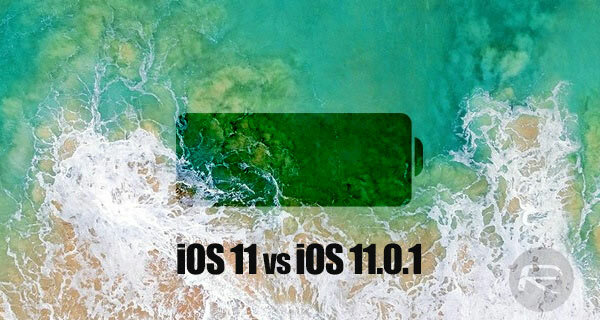 We’re still well and truly in that initial period of people scrutinizing the battery performance of iOS 11, but with iOS 11.0.1 now out in the public domain, has Apple made any noticeable power efficiency improvements? iAppleBytes has made a habit of trying to find out. Anyone with any previous interest in viewing these battery comparison videos will likely already know the process that the channel goes through to see if any fundamental improvements have been made with the latest release. A number of iPhones are loaded up with the latest firmware, which in this case is iOS 11.0.1, as well as the firmware which it replaces, which is the original release of iOS 11 (11.0). The devices are then charged up to 100% so that they are all starting in the same place before the test begins. It’s not hugely scientific, and it won’t guarantee exactly perfect results, but we do get an understanding of any initial improvements made. Once the devices are put into this state, the Geekbench battery test is then run on all of them which ensures that a series of battery draining processes are consistently ran in order to see how long the battery lasts for. When the battery dies, and the phone switches itself off, the time is recorded which gives us a fairly decent indication of any differences that may be in place with iOS 11.0.1 compared to iOS 11. For this particular test, iPhone 5s, iPhone 6, iPhone 6s and iPhone 7 were used with all devices showing that iOS 11.0.1 performs slightly better than iOS 11, apart from the iPhone 6s model. iPhone 5s managed to last 30-seconds longer running iOS 11.0.1. iPhone 6 managed an additional 10-seconds, and iPhone 7 performed the best on iOS 11.0.1 with an extra 7-minutes and 20-seconds of life. On the other hand, iOS 11.0 was king on iPhone 6s, with the device running iOS 11.0.1 dying approximately 12-minutes quicker than the one running the original release of iOS 11. It seems that Apple has made some battery improvements with iOS 11.o.1, albeit minimal, but for one reason or another, the iPhone 6s appears to be a total anomaly. I ave never has any battery issues with iOS 11.
didnt have issue with battery life for the ios11 but with the ios11.0.1, my battery is starting to drain real quick.